Why Soccer Player Misses the Easiest Goal? Why do football players missed the goal? &nbsp;In our time, soccer players often miss the goal. &nbsp;Here's an example, a football player misses the goal. &nbsp;can not score even one goal. In our time, football players cannot hit the goals from three meters. &nbsp;Why do I need a football? &nbsp;Players intentionally not scoring goals? &nbsp;the other football forwards never become Diego Maradona. &nbsp;many players involved in match fixing. &nbsp;(CNN) -- FIFA has imposed a worldwide lifetime ban from football on 41 players from Korea who became embroiled in match-fixing activities in their domestic league. &nbsp;In another episode that underlines the fight soccer faces to rid the sport of corruption, the game's governing body extended a ban handed down by the Korea Football Association (KFA) in 2011. &nbsp;Of those 41 players, FIFA have offered 21 who handed themselves in voluntarily a chance to return to the sport after a probationary period of between two and five years. &nbsp;The charges relate to match-fixing in Korea's domestic K-League competition and in all but one case were centered on offering or accepting bribes to throw matches. &nbsp;These latest sanctions add to a further 10 worldwide bans imposed on players from Korea in June last year. &nbsp;A FIFA spokesman told CNN: "The K-League first issued the sanctions, which were then extended by the KFA in summer of 2011 to have national scope, and then subsequently FIFA extended them to have worldwide effect. &nbsp;"FIFA announced 10 sanctions in June 2012 having received the case files from the KFA, and a further 41 Tuesday. There could still be further cases to follow, but we're not in a position at the moment to make any guess on numbers. &nbsp;"Of the 51 cases, only one was for betting, whereas all the others were either for giving, or accepting bribes to fix matches. &nbsp;"Of these 51 cases, 15 went to an appeal and an additional three persons (two players and one coach) committed suicide during the course of the investigations. &nbsp;"Some of the 51 people involved have also been the subject of criminal proceedings in Korea, including jail sentences." &nbsp;Soccer has been grappling with cases of match-fixing in recent years with Italian prosecutors conducting a wide-ranging investigation into some of Serie A's most high-profile clubs. &nbsp;Napoli were hit with a two-point penalty that dropped them from third to fifth in Serie A as part of the ongoing probe, though they vehemently denied any wrongdoing. &nbsp;Their defender Paolo Cannavaro is appealing his six-month ban for failing to report an illegal approach. &nbsp;Juventus coach Antonio Conte recently returned from a 10-match touchline ban imposed for failing to report match-fixing while coach at Siena. &nbsp;In 2006, Juve were stripped of two league titles and relegated to the third division of Italian football -- before later being reinstated in the second tier -- for their part in the "Calciopoli" scandal. &nbsp;Elsewhere, the president of the South African Football Association (SAFA) and four other officials were suspended in December as part of an investigation into match-fixing ahead of the country hosting the FIFA World Cup in 2010. &nbsp;It is alleged four friendly games were prearranged for the benefit of convicted Singaporean match-fixer Wilson Perumal and his Football 4U organization. &nbsp;In response to this threat on soccer's integrity FIFPro, the worldwide players' union, recently announced a project to tackle fixing that will include an education program and an online tool for their members to report illegal approaches. 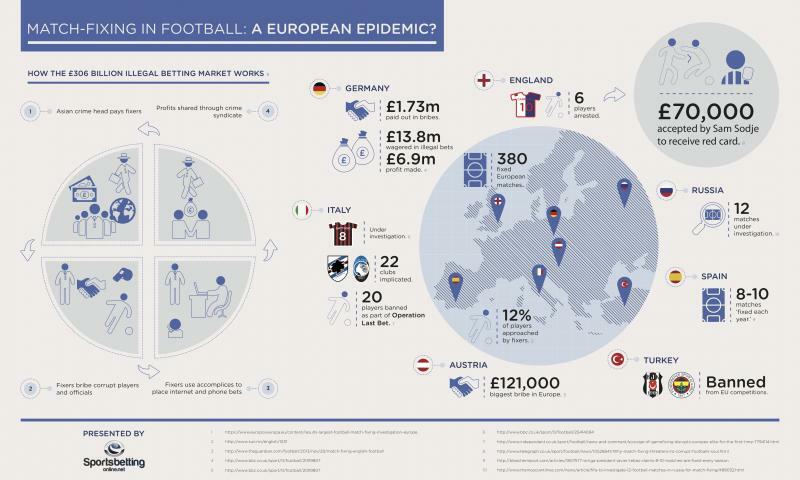 &nbsp;FIFPro have European Union funding behind their 'Don't Fix It' scheme and will be working closely with Birkbeck University and European soccer's governing body UEFA. &nbsp;The initiative will be launched in nine countries: England, Finland, Greece, Hungary, Italy, Norway, Romania, Scotland and Slovenia. &nbsp;The 21 Korean players who handed themselves in voluntarily will also be required to put themselves forward for community service if they decide they want to return to the game. &nbsp;A statement on FIFA's website explained: "These services include the provision of coaching classes for local football clubs for youth and adult players; involvement in and support of football for those with disabilities; and the support of ongoing and future domestic anti-match-fixing activities. &nbsp;"Players who are subject to voluntary probation may produce monthly reports on their respective community service activities, accompanied by documentary evidence of their activity (written, photographic or video). &nbsp;"The reinstatement of the respective player in football after the probation period will only be decided by the Korea Football Association (KFA)." &nbsp;Fifa should ban gambling methods of soccer first and then punish these players! &nbsp;As long as people are betting, these briberies will not stop. Sadly it all, corrupt football players, bad players who can not play football and that spoiled main bribe that destroyed modern football. &nbsp;Soccer is falling under a cloud of suspicion as never before, sullied by a multibillion-dollar web of match-fixing that is corrupting increasingly larger parts of the world's most popular sport. &nbsp;Internet betting, emboldened criminal gangs and even the economic downturn have created conditions that make soccer — or football, as the sport is called around the world — a lucrative target. &nbsp;Known as "the beautiful game" for its grace, athleticism and traditions of fair play, soccer is under threat of becoming a dirty game. &nbsp;"Football is in a disastrous state," said Chris Eaton, director of sport integrity at the International Centre for Sport Security. "Fixing of matches for criminal gambling fraud purposes is absolutely endemic worldwide ... arrogantly happening daily." &nbsp;— Chris Eaton, director of sport integrity at International Centre for Sport Security governing body — involving hundreds of people. &nbsp;Europol, the European Union's police body, announced last week that it had found 680 "suspicious" games worldwide since 2008, including 380 in Europe. RE: Why Soccer Player Misses the Easiest Goal? Why do football(soccer) players missed the goal? Now, the U.S. will play two teams from the USA, Kansas City - FC Los Angeles Galaxy, they score three goals or not? Kansas now scored a goal, the boys from Kansas excellent good work. Score more goals? !, just enough to run for 90 minutes can score two more goals? God heard my prayers, and Kansas scored another goal! What is the Icelandic championship began to not get in football goal. as in the Argentine championship began to play. No goals. 90 minutes only one goal What is the meaning of the football? Well, in the Argentine championship there at all is usually a goal for the entire game, or do not clog. At the World Championships Germans defeated Argentina. « How tall arnold schwarzenegger? And you know those that Arnold Schwarzenegger is not so high?